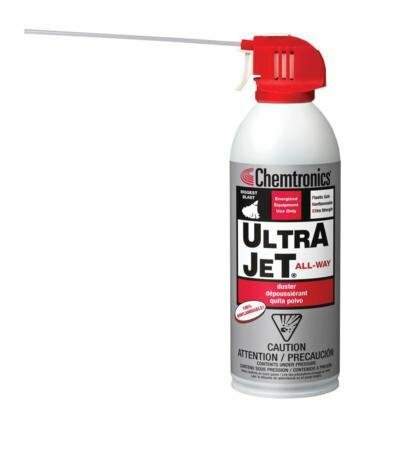 ITW Chemtronics ES1620 Ultra Jet All Way Can by Chemtronics at Andy Pemberton. MPN: ITW Chemtronics ES1620. Hurry! Limited time offer. Offer valid only while supplies last. This high-pressure duster is similar to the BIGGEST blast Ultrajet(r) duster (P/N ES10120), but with Chemtronic's exclusive ''all-way spray'' system. This high-pressure duster is similar to the BIGGEST blast Ultrajet(r) duster (P/N ES10120), but with Chemtronic's exclusive "all-way spray" system. You can now spray at any angle, even upside down, making it possible to clean those hard-to-reach areas without the risk of dispensing a liquid that can freeze or damage sensitive surfaces. 100% 1,1,1,2-tetrafluoroethane (HFC) gas. Contains no CFCs or HCFCs and has a zero (stratospheric) ozone depletion potential (ODP). Nonabrasive; safe for most materials. Ultra-pure; leaves no residue. Non-flammable.